This work was supported by the National Natural Science Foundation of China (21562021), the Natural Science Foundation (20143ACB21014), the Fellowship for Young Scientists program (2015BCB23009), and the Sci & Tech Project of the Department of Education (GJJ160763) of Jiangxi Province. 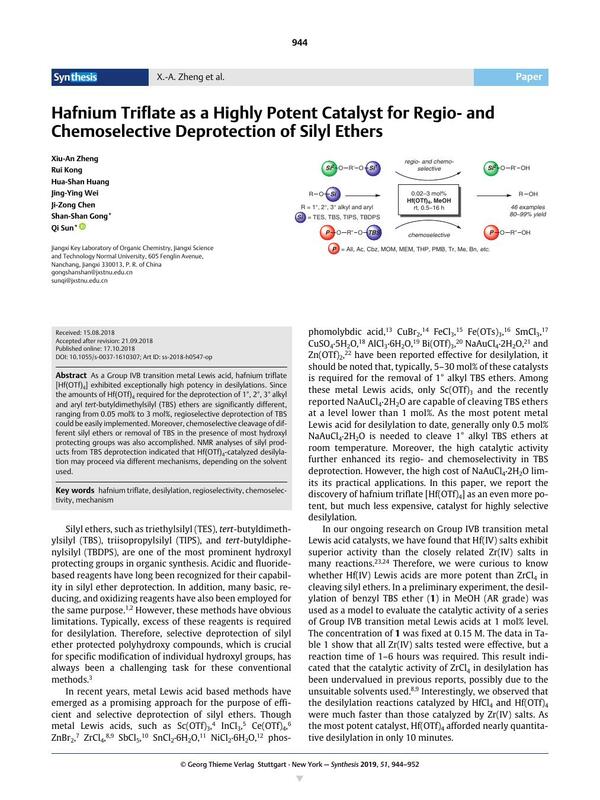 As a Group IVB transition metal Lewis acid, hafnium triflate [Hf(OTf)4] exhibited exceptionally high potency in desilylations. Since the amounts of Hf(OTf)4 required for the deprotection of 1°, 2°, 3° alkyl and aryl tert-butyldimethylsilyl (TBS) ethers are significantly different, ranging from 0.05 mol% to 3 mol%, regioselective deprotection of TBS could be easily implemented. Moreover, chemoselective cleavage of different silyl ethers or removal of TBS in the presence of most hydroxyl protecting groups was also accomplished. NMR analyses of silyl products from TBS deprotection indicated that Hf(OTf)4-catalyzed desilylation may proceed via different mechanisms, depending on the solvent used. Supporting information for this article is available online at https://doi.org/10.1055/s-0037-1610307. 1 Greene TW. Wuts PG. M. Protective Groups in Organic Synthesis . Wiley; New York: 1999. 3rd ed. 2 Kocieński PJ. Protecting Groups . Thieme; Stuttgart: 2005. 3rd ed.